Also known as water bears, tardigrades are probably the cutest microscopic animal. As you can probably imagine, after being around for 530 million years, they’ve developed quite a fan following. This 4¾" (12.1 cm) tall heavy cardstock air freshener smells like green apples. String for hanging included. Illustrated cardboard sleeve. 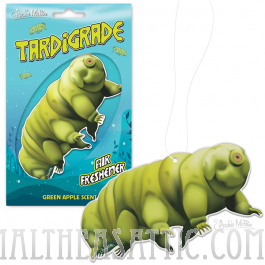 Also known as water bears, tardigrades are probably the cutest microscopic animal. As you can probably imagine, after being around for 530 million years, they’ve developed quite a fan following. This 4¾" (12.1 cm) tall heavy cardstock air freshener smells like green apples. String for hanging included. Illustrated cardboard sleeve. For correct usage, hang this product so that it can swing freely. Do not put this product in contact with plastic, wood, cloth or any other easily stained material. Do not rest this product on dashboard or air vents.